Irish all-female garage rock band September Girls released their second LP ‘Age of Indignation’ back in April, following their trip to America for SXSW 2016. I had a chance to hear a few of the new songs live at the Full Irish Breakfast on Friday during TGTF’s time in Austin, and I also had a chance to chat with two of the band members about the new album ahead of its release. Just this week, September Girls unveiled the latest single from the album, the hazy and hallucinogenic ‘Jaw on the Floor’, and I was reminded that I had promised our readers a full review of ‘Age of Indignation’. The Dublin quintet adopted their moniker from ’80s rock group The Bangles’ popular cover of the Big Star track ‘September Gurls’, and on ‘Age of Indignation’ they also take a cue from the sultry melodies, haunting vocal harmonies and heavy guitars that dominated The Bangles’ oeuvre. Album opener ‘Ghost’ is an immediate reminder of that inspiration, though from that starting point, September Girls take a darker, more psychedelic track, veering away from the pop-oriented sound that made The Bangles famous. An undercurrent of concern for social issues runs through the entire course of ‘Age of Indignation’, including social media-induced narcissism in defiant early single ‘Love No One’, domestic violence in the fast-paced track ‘Blue Eyes’, and organised religion in ‘Catholic Guilt’ and ‘John of Gods’. (The band members discuss these themes in more detail in their track-by-track guide to the album for Clash Magazine, which you can read here.) The band’s focus on feminism has led them to a much more focused musical approach as well, and the songs on ‘Age of Indignation’ fit together as a surprisingly tight and cohesive unit. The songwriting and lead vocals on the album are shared among the five band members, but regardless of who’s doing the singing, the lead melody is given predominance in the production mix, reflecting the importance and immediacy of the lyrical subject matter. The psychedelic haze of ‘Cursing the Sea’ is still present on ‘Age of Indignation’, but the new album has a much stronger sense of purpose and direction underlying its wash of guitars and gauzy backing vocals. September Girls’ righteous indignation at the ills of society has clearly led them to dig deep into their collective musical psyche, resulting in a much more resolute and determined sound on their second full-length release. By turns gritty and graceful, above all ‘Age of Indignation’ is above all an album that refuses to be ignored. 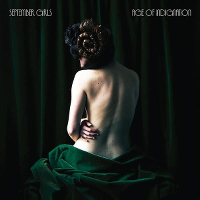 ‘Age of Indignation’ is available now on Fortuna POP! TGTF’s past coverage of September Girls, including features from their stop in Austin for SXSW 2016, can be found right back here. September Girls are set to begin a run of UK live dates next week; you can find the details here.